SOLAR X-RAY JETS: Astronomers using Japan's Hinode spacecraft have discovered that the sun is bristling with powerful "X-ray jets." They spray out of the sun's surface hundreds of times a day, launching blobs of hot gas as wide as North America at a top speed of two million miles per hour. These jets add significant mass to the solar wind and they may help explain a long-standing mystery of astrophysics: the superheating of the sun's corona: full story. "The image was taken through a Coronado Calcium-K PST," says Lawrence. "Its nice to see something tangible crossing the solar disk again." 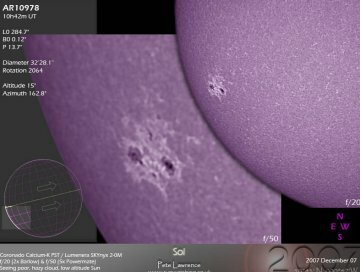 Sunspot 978 poses no threat for strong solar flares but this could change if its rapid growth continues. Stay tuned! 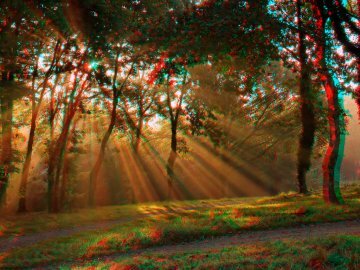 The anagylph was created from a pair of photos taken by Laurent Laveder of Quimper, France. "This morning, due to a thin haze in the valley, some nice crepuscular rays appeared," he says. "It was a nice opportunity to capture the relief with a 3D view." The full sized image is guaranteed to startle. On December 7, 2007 there were 908 potentially hazardous asteroids.